Platelet Rich Plasma injections, or PRP, are becoming very popular for chronic and acute foot and ankle ailments. Mill Creek Foot & Ankle Clinic is one of the few clinics in Snohomish County with the ability to provide this for their patients on a same day basis. Dr. Hall has performed approximately 100 of these injections, with great results, for several different foot and ankle issues including chronic plantar fasciitis (heel pain), chronic tendonitis of the Achilles tendon, chronic ankle instability and other ligament conditions. In addition to these, he has been performing these injections on acute injuries, such as calf strains and foot sprains to increase the likelihood of complete healing and decreasing the healing time for athletes. 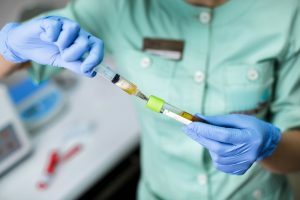 Recently, he has expanded the use of the PRP injections to include injecting arthritic joints in hopes to regenerate cartilage and thus decrease pain in joints. Studies have shown that a mixture of bone marrow aspirate and platelet rich plasma or PRP alone can regenerate type 1 collagen/cartilage that we are born with to help salvage arthritic joints. How is a platelet rich plasma injection performed? At Mill Creek Foot & Ankle Clinic, Dr. Hall will draw blood from your arm and then will spin the blood in a centrifuge to separate the whole blood from the plasma (which contains the platelets and all the necessary growth factors for healing) then, after numbing up the injured area, he will inject the plasma directly into the painful ligament, tendon or joint. After the injection, the patient is typically immobilized in a boot for 3-4 weeks to allow appropriate healing. When you injure any part of your body it begins a “healing cascade.” The first phase of this “healing cascade” is the inflammatory phase of healing. This is where the platelet aggregation occurs to coagulate the injury and to bring in necessary growth factors to begin the healing process. This is typically why we see redness around the injured area as your body starts the inflammatory process. This phase lasts 5-7 days. The next phase of the “healing cascade” is called the reparative phase of healing. This is when your body lays down collagen/scar tissue to mend the wound. This phase typically begins at 7 days’ post injury and lasts for a total of 2-3 months. Lastly, the Regeneration/Remodeling phase of healing occurs. In this phase your body begins breaking down scar tissue and remodeling the injured tissues. This phase begins at 3 months post injury and last for approximately 6 months. When a person injures themselves, if the injury is not treated appropriately or the treatment is delayed, incomplete healing may occur and your body then goes into a “quiescent phase”. This is where your body has basically given up on trying to heal the injury and thus your injury becomes a chronic condition. With the platelet rich plasma injection, we are reinitiating the inflammatory phase of healing by injecting platelets into the injured site and by creating new “trauma” with the needle piercing the injured tissue, thus your body will begin the “healing cascade” all over again to finally heal the chronic condition. For more information or to set an appointment with Dr. Hall, contact Mill Creek Foot & Ankle Clinic today at (425)482-6663.